Bella does an interesting upward cat. 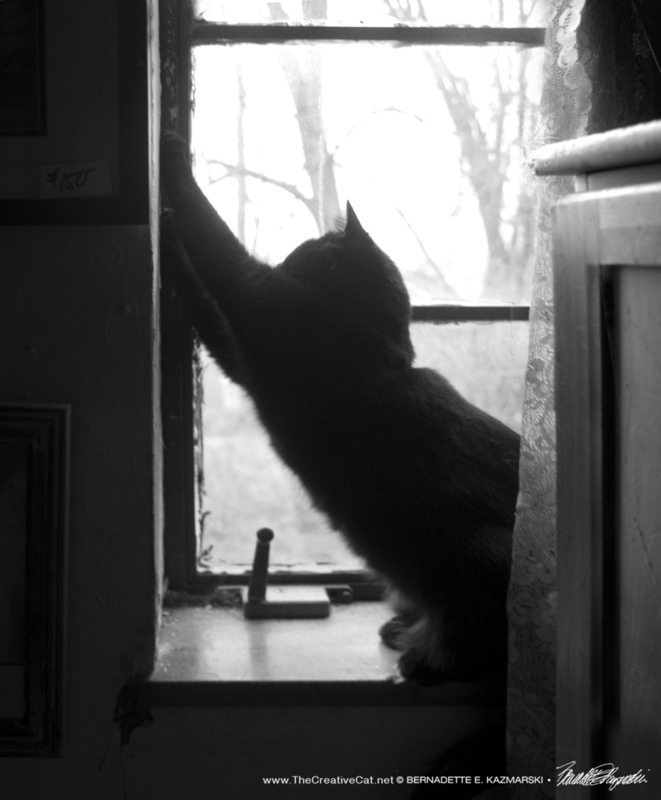 Bella does an interesting upward cat stretch while looking out on a snowy back yard. The eyes really have it! 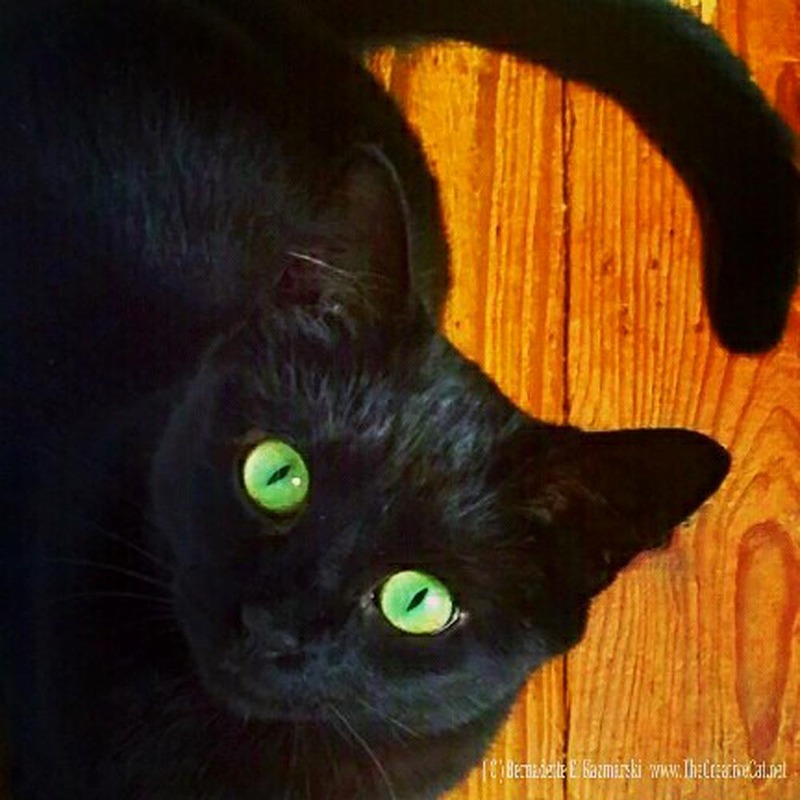 It’s the most extraordinary thing about black cats, the way their eyes just glow against their fur, no matter what color their eyes happen to be. I shared this from Instagram and used a filter, but think I might go back to the original and use Photoshop for a better view. We haven’t seen the last of Bella’s beautiful eyes! Bella not only flirts and is friendly with her fur brothers, but with other house panthers as well. From the first time she sent along encouragement to fellow rescued house panther Charlie the two have struck up a friendship and, like any modern-day kitty, they correspond via computer, though Bella is intrigued by all he little sticks that make marks all over all my desks and might want to see if she could send a message that way, as Giuseppe and Mademoiselle sometimes do. Bella considers writing a letter! Charlie is rather humble and shy and apologizes for the videos he sends to Bella and for taking her time. We don’t want to scare Charlie by telling him that Bella is an enthusiastic fan, but she is thrilled to receive them and has become quite the visitor at my desk wanting to see more videos and send messages to Charlie. In fact, before the videos, she rarely visited my desk. Bella patiently waits on my desk. The next video Charlie sent showed him being petted and happily purring. Please pardon me for being so forward as to send you another video. Perhaps I am brash, because I am excited with my new happiness. You are so very right – I love being petted. I will even come out from under the bed, when asked if I want pets. Of course, I do. And it’s not just the tasty fish flakes, that make me appear (though they are quite nice). Today was an exciting day for me – I saw the hallway beyond the bedroom door. My big cats say it was an “accident” – something about thinking I was my sister – quite silly as I surely can tell her from myself. I can tell that there are other cats besides the 4 I have met, but that frightens me, a little. How did you know that all of your big brothers and sisters would be friendly to you? Miss Bella – perhaps I should not mention this, but my big cats said something today about you being a “foster” – I know what that means from my time in the big house, before I came here to the little room. Fosters go away, and then they come back, only sometimes they do not. Miss Bella, will you go away and not come back? I know that I just met you, but I feel we have so much in common, and I would be very sad for you go to away and not see my videos any more. Bella was so excited by this she couldn’t answer but could only continue watching the video repeatedly. But finally she gathered her thoughts and responded to her new friend Charlie. I still have to run away sometimes when I see a hand reach for me though I know it is a nice hand. I don’t know why, sometimes it is too much. But I am sure to run to my human and ask for pets when I am ready for them. My little fur brother Smokie told me they were nice kitties and he had actually met them face to face, but we had a time when we could see them and they could see us and we could talk but we could not touch each other. Even though it sounds strange I forgot about it and we felt like we were together. Then, when we finally were, it was so easy, the scary thing was all the new spaces and the big ninjas were so helpful with that. I have heard that word too, and I have also heard that I will someday go off with another human, one who I have even met already. I don’t know why this is, but I have been several places before this one. I don’t understand how all this works because this was not what my mother told me my life would be like, but then she told me it would never be in these buildings with humans because they were bad. But I have so many things to do here I hardly have time to think of it. I guess we will have to see. The big ninjas don’t hesitate to let me know I have done something I shouldn’t, but they have taught me so much. They do not know the answer to this either, though they have seen others come and go in different ways. I am looking forward to another video. Someday I will make my own. Bella watches Charlie being petted. Another video from Charlie invites her for a drink! Bella was so excited I could not get a good photo, but she sat there so long her fur brothers lined up for computer privileges, Giuseppe to talk to Mlle. and Sunshine to message with Theo, and are a little miffed that Bella monopolizes the computer. Charlie sends the dear Ms. Bella this short video with the note: perhaps some day we can meet for a drink. My people have the most wondrous “fountain” filled with something called “filtered water”. I send you a photo of me trying it for the first time. May I be so forward to suggest that it would be a better picture if we were sharing? I have recently been exploring the entire house and although it is a little scary I am doing well. My friend Charlie, yes it would be nice to have a drink together but we could not be too close at first. Did you like to drink from the bottom or from the top? At first I drank from the bottom like a regular bowl but I have really gotten to like the little trickle because it MOVES. Our fountain is by the window and I can watch Cat TV at the same time and keep an eye on all those littlebirds and even nibble a plant just for me. It would be a great place to meet. Bella’s fur brother are waiting to see what is up. And yet another video shows Charlie curled on a human lap! I did it! I’m on my human’s lap, and purring while he strokes my face. You are right, it gets easier every day. Would I be too forward to say that I am thinking of you as I purr, glad that you have told me that the human touch is quite nice? I hope that you are enjoying the comfort of your own house panthers, but occasionally thinking of another one a few hours to your south who admires your courage. Seeing Charlie on someone’s lap, Bella had to check to see if this was correct. Bella watched this one several times and looked at the still photo she received as well. Charlie my friend, you are so so brave! You not only sat on a lap, you laid down! It does look so nice and comfy but I just don’t know if I could do that and relax. I try all the time when my human is working on her computer, climbing up from the floor I step on her lap and try to stop and sit down on her lap like everyone else, even Smokie, but I end up moving on and stepping up on the desk as if that was my intention and I’m just using my human as a stepping stone. I just can’t make myself do it yet but someday soon I will. It’s different to know you are thinking of me. My human told me you were in another place that was not a home for a while too, and so was I. I have met other cats but been a little frightened of them, but Smokie, little pest that he is—he is a full TWO MONTHS younger than me, and you know how kittens can be—welcomed me most gently and told me it was okay here my very first night. Now finally they feel like friends, and I feel like I could be friends with other kitties, like you. I have been here almost forever as I am beginning to forget the other places, but you have only been there a short time. Someday you will realize you forgot for a bit that all the cats and people and things seemed unpredictable. All of them will be yours and will do exactly what you expect.